International Comic Shops for Free Comic Book Day! One of the perks of running The Comics Cube! is getting to interact with a multitude of comics-loving people all over the world! I of course am from the Philippines, and I hope you guys all read my piece on my two favorite local comics stores a few days ago. Now I'm here to share with you guys some more comic shops around the world, in which some of the people I've gotten the pleasure of being introduced to via The Cube work. Enjoy! Can you remember when you fell in love with comics? I have been in love with comics for as long as I can remember. Even before I could read, I was entranced by TV shows like the 60's Batman, 50's Superman, Thunderbirds, Speed Racer and Super Friends. How and when did you realize you wanted to sell comics for a living? I did the usual thing, regular customer thinks "Wouldn't this be a great place to work?" We get three or four a week... but no, I didn't even consider it until a friend of mine who was working in a comic shop told me he was thinking of leaving. I'd just left teaching, so I thought, what the hell, applied. Now that I'm in it, I love recommending stuff to people. My favourite part of my job is hooking people up with stuff they may never have even heard of, which goes on to become their favourite comic. What is your store called and what was your initial vision when you started working in it? Ace Comics & Games, and when I started, I thought it was going to be pretty much typical retail, albeit somewhere I really enjoyed. Since then, I've come to see how vital product knowledge and enthusiasm for product is. I knew it was important from the outset, but it can sometimes make a huge difference. What's the key to a successful comic book shop? There are two big ones — customer service, which makes the difference between buying from a brick-and-mortar store and an online deep-discounter, and record keeping. Plotting trends, being aware of what's selling and what isn't, knowing what you have, what you need, placing and filling orders quickly and efficiently. Record-keeping is vital. In your run, what have been some of your favorite moments? Meeting comics professionals is a big one, and even more, interacting with them like we're part of the same (or at least a connected) business. That's been very rewarding, and pretty much all the people I've been able to meet have been very pleasant and had lots of fascinating stuff to say. However, the big one for me is connecting people to stuff they're gonna love. Kids and parents is a big one for me. Helping a kid discover the same love of characters and stories is a great thrill, and helping parents to use comics to encourage kids who aren't interested in reading is fun too, especially as a former teacher. But it's not all kids. For instance, a long-time customer who bought manga exclusively, recently started getting into other stuff via cartoons, movies, and TV. It's been really fun recommending stuff to her as its opened up a new world for her, and it's great getting her feedback on what she enjoyed and why. 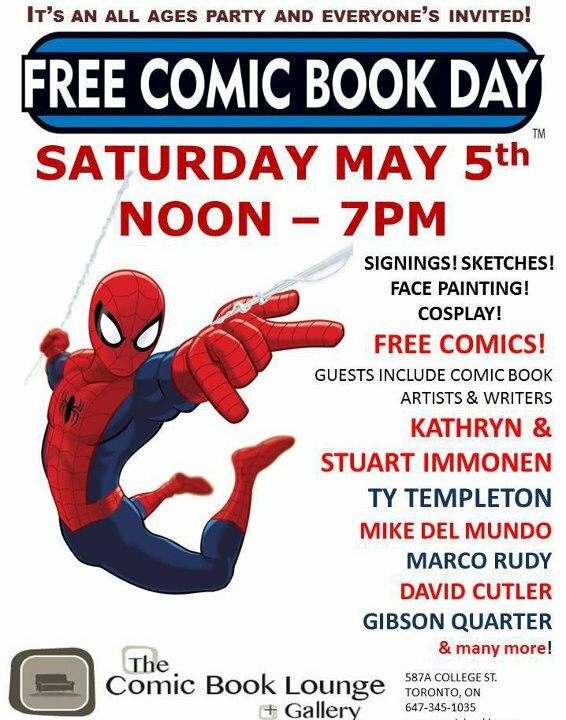 What does Free Comic Book Day mean to you as a retailer? It's a chance to meet your customers on a more casual basis, and a chance to recommend stuff to people who wouldn't normally get it. I like seeing the new faces FCBD brings to the store, and it's nice when they come back and follow up on the stuff they got from FCBD, especially parents with kids. What does Free Comic Book Day mean to consumers and collectors? For many, it's a chance to try something new, or get a sneak peek at upcoming stuff. For some, it's a chance to re-connect — the people who stopped buying comics and are interested in starting again, but aren't sure what's changed... it's got a kind of celebratory atmosphere. There's a real feeling to it, which I really enjoy. Can you name five comics and graphic novels would you recommend to your readers today? Five of my favourite go-to recommendations are BONE, ASTERIX, ATOMIC ROBO, GLOBAL FREQUENCY, and KING CITY. However, it's important to ask the customer what they want and what they're interested in. A lot of people come in and ask what I like, but I'm not the one the comics are for. I like to try and gauge a customer's interests as much as possible before recommending stuff. What FCBD offerings are you looking forward to? The Archaia Press (MOUSE GUARD) one looks ridiculous, I'm very much looking forward to checking that out. ATOMIC ROBO's FCBD outings have ALWAYS been good, and I'm sure this one will be no exception. I can never resist the Moomins (and why would you want to?) so I'm super-chuffed to see them in there. ROCKHEAD & ZINC ALLOY is interesting to me because Zinc Alloy is illustrated by one of my favourite Australian Creators, the absolutely sublime Doug Holgate. And Top Shelf's offering is always top-notch stuff. What do you add to FCBD to make it extra memorable for your customers? In the past, we've had local comics creators, local game developers and indie game demonstrations, and we'll probably be doing something similar this year, but in general, it's mainly the comics. Our main focus is that everyone who comes in gets to grab something that they're really gonna like. Ace Comics & Games can be found at Level 2, 121 Queen Street, Brisbane, Queensland, Australia 4000 or Shop 18, Annerley Arcade, 478 Ipswich Rd., Annerley, Australia. Their Facebook page can be found here. Pol's website can be found here. Sure can! I picked up SHOWCASE #73. First Creeper by Ditko and I was hooked. I found out about fandom by writing to DC editors from that book. I started amassing back issues in the late 70s via mail order, and when I discovered a comic shop 15 miles from my house I spent so much time there, they made me an employee. My store is called Heroland Comics, and I always wanted to be able to bring comics and comic-related items to the masses. What's the key to a successful comic book shop? Positive attitude about what is sold, solid business practice, know your customer base, love what you do. I loved when CRISIS ON INFINITE EARTHS #1 came out. I was giving copies away to Marvel customers that did not buy DC books, and letting them decide which was the better book, CRISIS or SECRET WARS. I still get thanked from customers that I turned on to that book. The 80s... 83-88 were fantastic time to be a retailer! Fun with a capital F.
I love it because it gives people a chance, especially kids to get into reading, and new customers to make happy. I make genre bundles to give away of overstock to really excited newbs. Consumers have more of an open mind, as well as collectors. I like when a consumer or collector says, "Got any more of this (fill in free FCBD title here)!" I do it a bit differently, letting my best subscribers (top 5) pick a few items and I feature them. Currently: RASL, POPEYE #1, FAIREST, SAGA, and Amalgam Comics TPBs. My pick is the MOUSE GUARD hardcover, but that seems narrow. I wish I had more. Well, besides the "genre bundles" that I give away, I have built a postcard customer base that informs and reminds people of the next FCBD. I see more new faces that way! Heroland Comics can be found on 732 S. 11th. Niles MI, USA. Absolutely. The first time I picked up a comic was AMAZING SPIDER-MAN #300, the first appearance of Venom. Since I grew up in a typically geeky household, I grew up watching science fiction and things of that nature but comics....comics were my dad's arena and it was his copy of Spider-Man that I picked up (which is now mine). Never had I read anything that was so out of this world as that issue for not only was Spider-Man struggling with his identity, it unleashed this nightmarish villain, the likes of which I'd never seen in all the movies we were shown as kids. It was wonderful and to this day I hold an appreciate for McFarlane's run on Amazing Spider-Man. It's been a nonstop journey since that tender age of 12. Probably about two months into working at the comic shop. I was looking for a part-time gig and I saw the ad for it on my Facebook and I immediately called, went in for an interview and bam, was hired. I was thinking it was going to be a little stocking, a little cashier work, but once I dove into the comic industry, I didn't want to leave and soaked up everything I could learn. I quickly transitioned to being full time and I can't imagine wasting my life at some unfulfilling 9 to 5 doing something I loathe. It's called Keith's Comics and it was founded by a regular joe who wasn't accepted into corporate America, and when I first started working here — I know it's kind of sexist to say, but it needed a woman's touch. I wanted it to become more than it was and to do that, proper organization, signs were needed so we could be more approachable as a store. While I'm here, I want Keith's Comics to be known as a friendly, marketable chain, with staff that are equally approachable and are able to find things, no matter how obscure. Definitely a proper balance between back issues, collected editions, and new weeklies as well as a staff that are eager to help and engage their customers. Being able to help an older gent (maybe in his early 70s) remember the title to a comic he read as a kid and helping him find a collection so he could read it to his grandchildren. Stuff like that, that shows a love of comics across generations and makes my heart twinge with happiness. Also, any moment I can turn a comic reader from the path of wickedness (i.e., Liefeld reading) onto the path of righteousness is memorable. FCBD means three things: a party, an excuse to cosplay, and potential new readers. Our regulars see it as a way to score free stuff as a reward for coming to our shop every week for their pulls. Collectors are in it to win it so to speak, so they tend to grab one of everything in the hopes that one of those issues will be valuable in the future. Five? I can certainly try. I always always ask what kind of books they like to read and if they want something superhero or nonsuperhero to read. This is most important. Based on that, I zoom right away to Y: THE LAST MAN for nonsuperhero wants and to INCORRUPTIBLE and IRREDEEMABLE for the superhero wants. Aside from those, WALKING DEAD is one I regularly up-sell since almost everyone has heard of the show, HELLBOY or BPRD are a tie for fourth, and either RUNAWAYS or BATMAN RIP for the person who wants something from the big two. Shhhh, I've read some of them already but I definitely want to take that Archaia hardcover and DC title home!!! Oh! There's also a sneak peak to Stieg Larsson's THE GIRL WITH THE DRAGON TATTOO's graphic novel adaptation that I want as well. Me personally? Just my normal bubbliness and enthusiasm for issues I'm excited about. Building that rapport with people is extremely important for me so that's really all I have to bring to the table. Keith's Comics can be found at 5400 E. Mockingbird Lane #120, Dallas, TX, USA. Their Facebook page can be found here. Leia's website, IHOGeek, can be found here. I remember sitting on my parents' couch, reading SPIDER-MAN #35, the middle piece of the "Maximum Carnage" crossover at some point in the second grade. I was absolutely fascinated with the huge and insanely varied cast of characters and most importantly the feeling that these characters were all coming from somewhere and they were going somewhere too. Couldn't stop reading after that! Quite honestly, I rather fell into it. I did grow up wanting to write comics professionally and if I couldn't do that, then own a comic-book store. 'Course, I also said I wanted to be a teacher and a rock star and live in New York City. Only one of those came true! Honestly, if I'm not writing comics, editing comics, or reviewing comics there's nothing I'd rather be doing than selling comics. I was dating the right girl at the right time, right out of college. She got me my first job at a comics store and so I moved to Manhattan. Two years later, after a few odd jobs like bookstores, I found a store under new management willing to give me a shot. I've been there ever since. I work at Manhattan Comics & More, at 10 E 23rd Street across from the gorgeous Madison Square Park in New York City. I guess my initial vision was the creation of a place for myself and for the store. I was new to the store but the store was almost just as new to NYC! I feel the big key is community. And I think my colleagues at Manhattan Comics would agree with me. Remembering our customer's names, being honest with them, being friendly with kids, being there as they grow up. We strive for that every day. A: Having both Geoff Johns and Jim Lee signing at the same time on the release day of "Justice League" #1 was pretty cool. 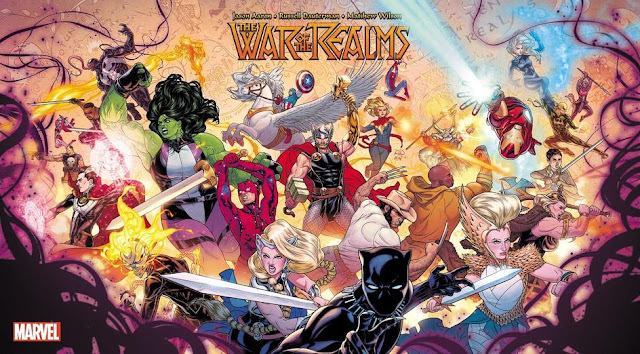 To have the main team of one of the biggest comics of a given year in person on the day it comes out? Just a rare treat. But my favorite moments, without a doubt, come directly from our customers. A gent came in once who had just become employed again and told us it was the first time he could afford comics in months. "I feel human again," he said. Well, bluntly? A chance to make new customers! A chance to bring more people to the medium and the way we sell it! Well, I hope the regular comics readers of the world see Free Comic Book Day as I do: a blessed little day once a year when EVERBODY can and often do join us in experiencing this artform we love! And hopefully, a few new readers stick around. That and, you know, a day you can get something cool for free! I love to recommend THE LI'L DEPRESSED BOY by S. Steven Struble because it's a simple, fun, human story. It might just be STRANGERS AND PARADISE for the next generation. I'll try to put THE SIXTH GUN, a fun western-supernatural-adventure book in people's hands. The always safe recommendation is Craig Thompson's BLANKETS from 2003. Amazing. I've often suggested MARVELS as a book to get acquainted with the world of the superhero genre. And a recent piece of awesomesauce is Mark Waid's run on DAREDEVIL. The Transformers franchise is getting a third ongoing added to its roster and DC is releasing a preview of their upcoming superhero romp. That's all very cool, but as a fan of Joss Whedon's Firefly there's no doubt I'm most looking forward to the new short SERENITY comic. Humans! Namely our customers, our guests, and ourselves! Just a pile of free comics isn't going to make the day work. We have to find cool guests and be on our retail game big time! The people will come (the sign outside says FREE COMICS after all), but the trick will be giving them a rocking time while they're here. That's my job. 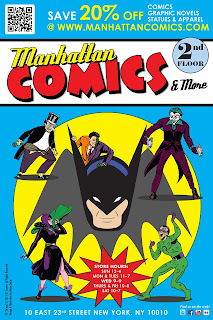 Manhattan Comics & More can be found at 10 E 23rd Street, New York, NY, USA. Their Facebook page is here. Jon is one of the writers of The Long and Shortbox of It! Hard to say, I was about 3 years old when I started reading comics, they've always been a part of my life. I didn't! When I was in my 20s I considered opening a store and thought better of it. I'm now a retailer by chance. There was a void that needed to be filled with the closing of Dragon Lady Comics and I was put in a position where I could fill that void. It's called the Comic Book Lounge + Gallery, and the philosophy behind it is to create a new type of comic book store, less about back issues and more about being a community space. We're in a unique position in that we share the space with two other businesses — a comic arts school and a printer that specializes in printing small press comics and materials for artists. I'll let you know when I find out! Heh... no, it's hard work and product knowledge. It's constantly being on top of what is available and knowing what your customers are interested in. We just opened in February, so my favourite moments are centred around our big opening night party and the responses that people have had to the business. I consider FCBD to be our day to shine to the community. The one day of year where comic retailers are honoured, and in turn, stores invite people in to check out what we have for them and sample a selection of great comics by various publishers, as well as to look around and see what else is available. A chance to taste test the latest from various publishers, and in some cases, interact with artists and writers directly. Today? Well, it depends on the customer but within the last few weeks of products I would recommend POPEYE #1, AVENGERS VS. X-MEN issues, the BATMAN: COURT OF OWLS crossover issues, FLEX MENTALLO, and X-O MANOWAR #1 (which is out this week). The Archaia hardcover, the Valiant preview, Simpsons, DC: The New 52, Donald Duck, and the Marvel and DC offerings. We have a lot of guests coming including Kathryn and Stuart Immonen, Ty Templeton, Marco Rudy, Mike Del Mundo, Raff Ienco, Gibson Quarter, and some of the school's alumni. Plus we are offering face painting for younger fans, some cosplayers will be appearing as superheroes like Thor, and we are expecting a visit from Toronto Batman. In the evening, we are launching a talk show event "On the Couch with Ty Templeton" where Ty discusses comics industry topics with various industry pros. 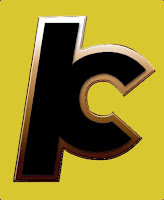 The Comic Book Lounge + Gallery can be found at 587 College St., Toronto, Ontario, Canad. Their Facebook page is here. Enjoy Free Comic Book Day, folks, wherever you are!